The Cart-Away mid-size concrete mixing trailer has been efficiently delivering concrete to community sidewalk projects for over 20-years. The Cart-Away mixer can transport and deliver up to 1.75 cubic yards of quality concrete directly to the forms without high delivery cost. 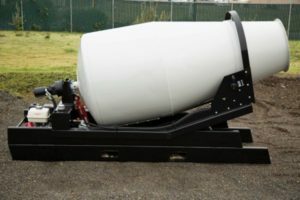 The drum trailer produces a quality of concrete on equal with those of the large ready-mix trucks, yet it can maneuver into tight spots and does not crush the city infrastructure during delivery. Cities from California to Florida have found this concrete delivery system to be the ideal for sidewalk replacements in the 1 to 5 cubic yard range. 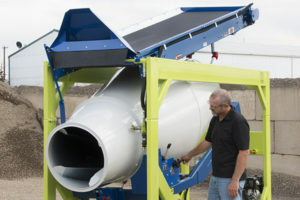 The mixing trailer can be towed by most city or contractor pick-up trucks making scheduling deliveries and meeting deadlines much easier than other options. 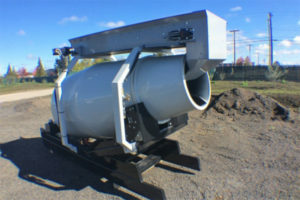 The contractor mixer can be purchased or rented locally to mix concrete at the job site. The mixing capacity of these small mixers (up to ¼ cubic yard) does restrict production rates and adds labor costs to the project. Traditionally a contractor mixer uses pre-packaged bags of concrete mix which raises the cost for 1-cubic yard or larger pours. Great care should be taken to insure that the pre-packaged concrete has the correct strength for sidewalk traffic without the need to add extra cement powder. The contractor mixer does allow the crew the flexibility to produce concrete on their schedule. These concrete delivery vehicles can produce ready-mix at the job site, making them the best choice for projects where there is an unknown quantity needed. They use a short auger-screw to blend the raw materials before it is moved to the forms. Because they pack up to 50,000lbs of material in a truckload, care must be taken to not damage surrounding infrastructure during the pour. 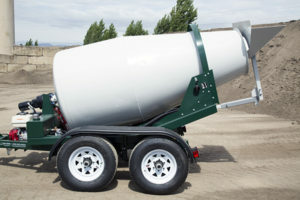 These mixers require a trained driver and expensive equipment, so delivery fees or minimum charges are assessed in order to have a truck arrive at the job site. There are usually a limited number of the volumetric trucks available in each community, so scheduling can sometimes be an issue. The transit mix truck is the most common concrete delivery vehicle in every community. The mixing drum produces the highest quality concrete because the ingredients stay in the drum for at least 10-minutes to fully mix. These trucks are ideal for large pours above 5-cubic yards where they are very efficient. Small projects are forced to pay “short-load” fees and stand-by charges that can be as high as $300 over the cost of the concrete. The weight of a transit-mix truck requires extra care so as to not damage streets, curbs and gutters at the job site. The availability of transit-mix is great, as most communities have several local suppliers. But, scheduling a small load of concrete in a truck is problematic because these suppliers put larger pours as a priority and move the small stuff off to the end of the day. Difficult scheduling causes the cost of labor to go up as the crew waits on the truck. Contractors sometime complain about quality when a supplier sends concrete that is “left-over” in a truck from another job (they call this a “hot-load” because it cures really fast and is hard to finish).